At Audi Memphis, we know that great things can often be found in small packages. This is undoubtedly true of the popular Audi A3 sedan, which combines solid lines with a performance one might think can only be found in larger cars. 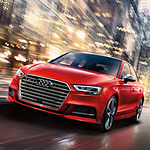 The heart of the A3's power comes from its standard 2.0-liter four-cylinder turbocharged engine, which when combined with the available all-wheel drive offers an impressive 220 horsepower and takes a mere 5.8 seconds to go from zero to 60 MPH. You'd think that such top performance would make the A3 a gas guzzler, but the A3's engine is as efficient as it is powerful, offering a combined 29 MPG, perfect for cruising Memphis's streets or taking it on a leisurely road trip. Take the 2018 Audi A3 for a test drive and discover its power for yourself today!